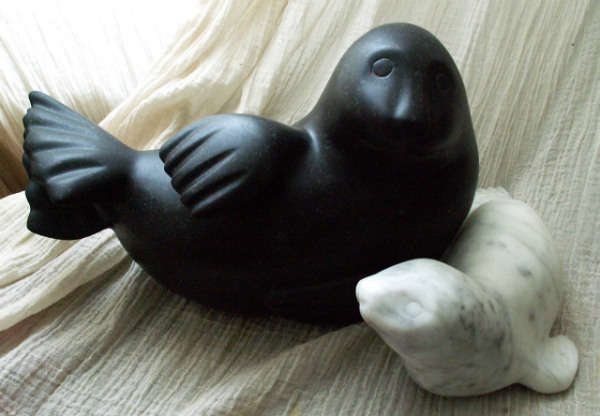 I am inspired by art of different cultures, geometry and nature, but mostly carve the natural form – I enjoy trying to capture the animal’s individual character and spirit – discovering more about the stone itself, its limitations and possibilities. I studied Stonemasonry at Bath College and have worked as a stonemason and carver since 2001, doing restoration, memorials and fireplaces and on pieces for Salisbury and Exeter cathedrals. These days I work mainly on sculpture commissions in limestone, marble and alabaster. I now live and work in Aveton Gifford with my husband, Andy and dog, Bonnie.